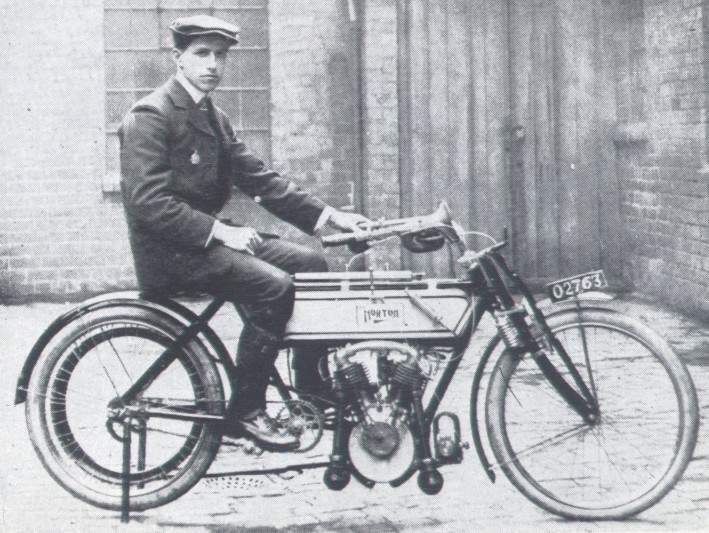 1907 NORTON TWIN. The name "Norton" has more links with the T.T. series than any other. Amongst the marque's claims to fame there is one that cannot possibly be equalled by any rival—there has been a Norton in every year's T.T. race since the series started in the first decade of the twentieth century. The original race for the Tourist Trophy—a name that seems particularly inappropriate for the racers of the sixties—was in 1907 over ten laps of a course that started and finished at the village school at St. Johns in the Isle of Man. The roads were primitive. This first race included an award for the best performance by a twin—these were generally expected to be slower than the singles— although if the first machine to finish had been a twin it would have won the Tourist Trophy. As it happened, a Matchless single won—but Rem Fowler had rushed his Norton round to make fastest lap at over 40 m.p.h. Punctures and other troubles slowed him and he had to be content with the honour of winning the twin-cylinder race at 3622 m.p.h. His machine employed a French Peugeot engine of an alleged 5 h.p. Induction was by automatic inlet valves—that is, the depression in the combustion chamber caused by the piston descending sucked the valve, held by a light spring, open and mixture in. The exhaust valves were provided with a cam! Front forks were reminiscent of a bicycle's, with small coil springs, giving about ij-in. movement, and stiffening blades from top to spindle. A bicycle-type brake was used on the front rim. Rear springing was almost unheard of then—and comfort, with 2j-in. section Clincher tyres and a Lycett cycle-type saddle, must have been poor. They call this machine's grandson a "Featherbed"! Engine: Peugeot Vee-twin 5 h.p. (726 c.c), automatically operated overhead inlet valves, side exhaust valves. Ignition: Bosch magneto. Transmission: direct drive by Lycett leather "Rawhide" Vee-belt from engine to rear wheel; no clutch, no variable gear; pedalling gear fitted—and useful. Frame: diamond pattern with single down-tube to front engine plates; rigid rear frame section, Prices rear stand. For the British, racing along the rocky road over the Isle of Man was comparable to repeating the splendid first edition of the London-Brighton race, the famous Emancipation Run. In 1907, after years of negotiations with national and island authorities, permission was obtained to hold a major international race, the Tourist Trophy, on the island. Almost all the British manufacturers entered motorcycles, including Norton, Triumph, and Matchless. They entered specially prepared racing models that could stand the strains of the race. The steep ascents presented a new challenge to mtotor-cyclists of the time. Norton entered a sturdy streamlined motorcycle with a four-stroke, two-cylinder V engine built by Peugeot. Although the engine was rather outmoded in concept and generated relatively low power, the chassis was extremely light and well balanced. Rem Fowler rode the vehicle to win the two-cylinder trophy, traveling at an average speed of about 37 m.p.h. The Norton triumph has gone down in history because this was the first running of the most famous race in the world, rather than for any technical achievement. Nevertheless this success led James Norton to commit himself further in speed racing. In 1908 the company produced its first single-cylinder vehicle. Engine: Peugeot two-cylinder V, four-stroke, with automatic intake valves and side exhaust valves, mechanically operated. Displacement 726 cc. Maximum speed: About 62.5 m.p.h.